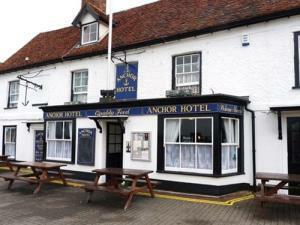 The Anchor Hotel01621 782117work RestaurantFollowing extensive works, the Anchor Hotel in Burnham-On-Crouch has re-opened and offers a great range of ales, lager, freshly prepared food and beautifully appointed letting rooms. Our daily specials ensure that there is always something to suit everyone, as well as themed offers throughout the week. We offer a fantastic Sunday Roast for only £7.95 with the option to add a starter or dessert for combined price of £10. . .how can you resist? With features such as a four poster bed, our family room and stunning views over the River Crouch, the Anchor provides an affordable yet memorable stay whether for business or pleasure. We have Doombar and Greene King IPA as permanent features with an ever rotating guest beer offering. Check out the what's on page for today's selection. Featuring Carlsberg, Fosters, Becks Vier and Stella on draught, we have something for everyone. We also have an excellent range of bottled beers including Peroni. Following extensive works, the Anchor Hotel in Burnham-On-Crouch has re-opened and offers a great range of ales, lager, freshly prepared food and beautifully appointed letting rooms. Stowford Press and Aspall are available on tap as well as Bulmers no17 and Koppaberg by the bottle.